Ireland and Georgia managed to go the length of 2018 without playing each other at football - the first time such a thing had happened since 2012. In order to make up for this, we're down to play them twice in 2019. Georgia joined the UEFA fraternity in 1992, the year after the collapse of the Soviet Union, and first met Ireland in 2003. Thereafter, we've played them at the rate of roughly once a fortnight. Here are five of the most memorable games. The first competitive match post Mick McCarthy Mark I. And our first ever international against Georgia. The game didn't really witness the flowering of a beautiful friendship as the home crowd were in a 'Welcome to Hell' sort of mood. Lee Carsley and Damien Duff were hit by plastic bottles, Gary Breen was struck by a ball bearing and, most disgracefully and dangerously of all, a pen knife came whizzing past Kevin Kilbane's arm. The winger was unsurprisingly miffed by this and made sure the ref knew what happened. 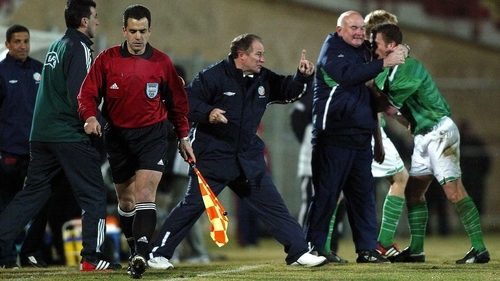 The Ireland players got out of Tbilisi without being seriously maimed and managed to leave with full points too. Duffer scored a rickety little goal early on and Gary Doherty powered home a winner in the final 10 minutes. It seems that the karmic Gods of football took a dim view of the Bill the Butchers in the crowd that night as the Georgians have had a fair dose of bad luck in this fixture since. A game best remembered for its ingenious usage in Roy Keane SC's devastating oral argument against a France-Ireland replay. The learned barrister from Mayfield cited as precedent the Ireland penalty against Georgia with 20 minutes left at Croke Park and all the Facebook petitioners and Henry Hoover boycotters were struck dumb in response, not to mention those who cover the beat down at Ipswich Town. "I don't remember the FAI saying after the game that we should give them a replay," he said emphatically, in words which had a most persuasive effect on the jury. Reeling from the blows, the replay advocates tried another strategy, the so-called 33rd team gambit, which succeeded in bringing upon themselves only ridicule. Alexander Iashvilli put the Georgians ahead after one minute, capitalising on some confusion in the Irish defence. 70 minutes later, Ireland hadn't yet equalised. On 71 minutes, Kevin Doyle contested a second ball with a Georgian defender on the edge of the penalty box. The ball ricocheted upwards, hitting Doyle on the chest and deflecting in the direction of a Georgian full back, apparently grazing his right arm. A few Irish players appealed for the penalty, which most observers felt took some neck at the time. Happily, the referee didn't agree and pointed to the spot. The disbelieving Georgians engaged in a bout of ferocious pleading, urging the stony-faced official to consult with his linesman. He wasn't for turning on the issue. Replays indicated that the ball had grazed an arm but it was marginal and obviously accidental. Robbie slid home the penalty and the winner four minutes later after meeting a corner with a combination of his head and his neck. Ireland's march to the fateful playoff in Paris remained on track. The Georgian version of RTÉ or The42.ie or Balls.ie will probably be doing retrospectives about the injustice for years to come. Their equivalent of Sofia '77 or Brussels '81. Another of those Irish wins which an ungrateful public were blase about at the time but which turned out to be deeply important down the line. Armenia in September 2010 is another classic of the genre. An away match which Irish fans presume their team should be winning. They struggle for long periods before scuffing home a winner late in the day. The media and the fans proceed to grumble about the manner of the victory. Then we sit back and reappraise as our qualification rivals subsequently shed points at the same venue. Ireland's qualification hopes appeared to have run aground by the summer of 2015 but the Scots, as we know, are always good for tossing in a shocker in Eastern Europe. And so they did again in that campaign, Valeri Qazaishvilli sealing his place in the Gary Mackay Hall of Fame with the winner against Gordon Strachan's team at the beginning of September. The Georgia away game itself didn't quite engage the public at the time, coming as it did after a quiet 2014. But it turned out to be the finest hour for the man Giovanni Trapattoni used to call 'MacEddie'. With Ireland about to suffer an overdue draw away to the Georgians, McGeady's Cruyff turn and curling shot rescued the win. The trouble with the Georgians was that Seamus Coleman did manage to walk it in. 2016 was the last good year for Irish football on the field and, until a few weeks ago, we had presumed it was a good year financially as well. The team performed creditably at the Euros, save for the Belgium game, beating Italy and scaring France in the last-16. They avoided a repeat of Euro 2012 where they looked like a team who arrived at the tournament by mistake, accidentally being booked to appear by UEFA in place of a more deserving team. And they ended 2016 on top of their World Cup qualifying group following a highly impressive 1-0 win away to Austria. In between however, there was time for another deeply uncomfortable evening against Georgia. Come half-time, it seemed, judging by social media, that all the goodwill of the Euros had been spurned. That familiar note of exasperated contempt came wafting out of the Twitter machine as yet again Ireland huffed and puffed and misdirected passes against lower ranked opposition. Eventually, Seamus Coleman decided he'd had enough and barged through the Georgian rearguard like a kind of soccer playing Marshawn Lynch and simply ran the ball into the goal. It was a strike (if that's the right word) fitting of the occasion. Ireland did as they had been threatening to do for a long time and proceeded to not beat Georgia in a football match. Readers in Galway and Waterford may not remember the game as they were by that stage wrestling their own grandmothers for the last All-Ireland ticket. Chief goal threat Shane Duffy headed Ireland into the lead in the opening minutes, greatly helped by Ciaran Clark's flying arm colliding with the goalkeeper in the lead-up. Sitting at home (though probably not watching the game, let's be honest) Alan Shearer and Sol Campbell thought of St Etienne in '98 and pondered what might have been. Ireland thereafter decided that possession was only a nuisance and mustered 31% of it for the rest of the game. This would have been fine had the Georgians not upended the plan with an equaliser just before half-time. It couldn't be said that Ireland pummeled them into submission for the remainder of the game, though James McClean and McGeady both had great chances in the closing stages and could have stolen the victory, a la 2014. At the time, it felt like a crushing blow to Ireland's playoff hopes. As it wound up, thanks to the dramatic events of Cardiff that October, Ireland did make it that far in the end, living to die another day. Irish football has beaten itself up too much at our often plodding wins over Georgia in the past 16 years. These are, after all, two countries in the same ballpark population wise and the Georgians have unsettled, and occasionally beaten, plenty of other teams. Perhaps the surprise was that the winning record lasted so long. Can it be restored on Tuesday evening?